TORRANCE, Calif., Jan. 4 /PRNewswire/ -- Toyota Motor Sales (TMS), U.S.A., Inc., announced manufacturer’s suggested retail prices (MSRP) today for the all-new 2007 FJ Cruiser sport utility vehicle (SUV). The all-new FJ Cruiser SUV was created to give customers the freedom to go anywhere and do anything. The overwhelmingly positive response to the FJ Cruiser concept, developed over three years ago, prompted Toyota to launch a production version of the SUV. The all-new production model retains much of the design details of the original concept. Chiseled from nearly a half-century tradition of tough off-road performance provided by the legendary FJ 40, the original 4Runner, and 4x4 compact pickups, the FJ Cruiser was developed as a capable and affordable off-roader aimed specifically at young buyers with active outdoor lifestyles. 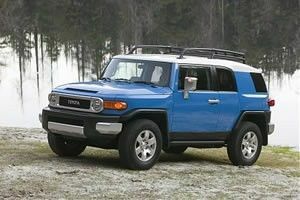 The FJ Cruiser takes on an authentic functional form, yet adopts several styling cues from the original FJ 40. Some of these cues are notable on the front end by its wide grille with "Toyota" logo badging, round headlights, and offset combination lamps. Additional inspiration can be found through its upright windshield and white cap roof. Traits are also noticeable in the rear with wrapping rear corner windows. The modern shape of the FJ Cruiser is woven into a compact package set on a wide track, producing enhanced stability and a powerful stance. Power is supplied by a 4.0-liter V6 engine, which generates 239 horsepower and 278 lb-ft. of torque. The engine is paired with a five-speed automatic transmission on both 4x2 and part-time 4x4 configurations and an available six-speed manual on full-time 4x4 models. The five-passenger FJ Cruiser rides on a modified Prado (overseas Land Cruiser configuration) platform and features 17-inch steel wheels and four-wheel disc brakes. Just like all of the SUV’s in Toyota’s line-up, the FJ Cruiser will be equipped with the STAR SAFETY SYSTEM(TM) which includes Vehicle Stability Control (VSC) and traction control (TRAC), an anti-lock brake system (ABS) with electronic brake-force distribution (EBD) and brake assist as standard. All 4x2 models will come with a standard automatic limited slip differential (ALSD). Utility features include a two-part rear hatch with flip-up glass, black overfenders with mudguards, and silver painted bumper extenders, mirrors, door handles and skid plate. Easy rear passenger entry into the two-door SUV is achieved with rear access doors. Additional optional equipment includes 17-inch aluminum alloy wheels, rear differential lock, electronic four-wheel traction control (on 4WD models only), running boards, rear sonar backup assist, front seat-mounted side airbags and front- and rear-side curtain airbags, daytime running lights, power outside mirror with image lights, cruise control, AM/FM CD audio with a six-disc changer, equalizer and eight speakers, leather-wrapped steering wheel with audio controls, multi-information display, exterior color door insert panels, privacy glass, and rear wiper. Pricing for the FJ Cruiser will reflect an excellent value when it launches this spring. The FJ Cruiser 4x2 with a five-speed automatic transmission will carry a base MSRP of $21,710. Pricing for the FJ Cruiser 4x4 with a six-speed manual will be priced at $22,890 while the 4x4 with a five-speed automatic will start at $23,300.